Buy Bob's Red Mill Vital Wheat Gluten Flour online from our UK Health Food Shop. We sell Suma Vital Wheat Gluten Flour - 500g and other genuine Bob's Red Mill products in the UK. Wheat Gluten is 75 to 80% protein and can be added to your favourite bread recipe to improve texture and is also used to make seitan. If you want to automatically receive an email when 'Vital Wheat Gluten Flour' is back in stock, just leave your email address below. Vital Wheat Gluten is made from the natural protein found in the endosperm of the wheat berry. When combined with water it becomes highly elastic and taffy-like. Added to bread dough, wheat gluten helps retain the gas and steam from baking and gives more volume to the baked bread. Vital wheat gluten is a staple ingredient for meat and meat substitutes. It acts as a binder for meatballs, meatloaf, veggie burgers and tofu alike. Vital wheat gluten is the main ingredient in the popular meat substitute, seitan. Our UK Health Shop sells real Bob's Red Mill and other Other Flours from top-quality brands safely online to customers throughout the United Kingdom in England, Wales, Scotland and Northern-Ireland. View more products on the Online Health Food Store from Bob's Red Mill. Where to buy Bob's Red Mill Vital Wheat Gluten Flour safely online? 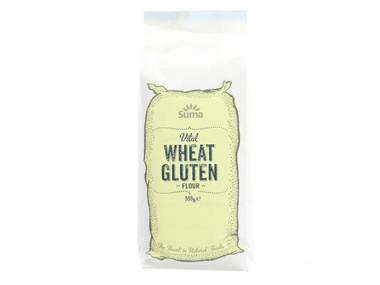 Shop at the Online Health Food Store if you are wondering where you can buy Suma Vital Wheat Gluten Flour - 500g safely online in the United Kingdom. Our Health Shop is located in the UK and our award-winning independent has been serving customers in England, Wales, Scotland and Northern-Ireland since 1976. You can buy our Other Flours online and we post out orders to any UK address. Vital Wheat Gluten Flour - Suma Vital Wheat Gluten Flour - 500g in Other Flours and Baking.